329 pages | 149 B/W Illus. Reflecting the increased importance of the collaborations between radiation oncology and informatics professionals, Informatics in Radiation Oncology discusses the benefits of applying informatics principles to the processes within radiotherapy. It explores how treatment and imaging information is represented, stored, and retrieved as well as how this information relates to other patient data. The book deepens your knowledge of current and emerging information technology and informatics principles applied to radiation oncology so that all the data gathered—from laboratory results to medical images—can be fully exploited to make treatments more effective and processes more efficient. After introducing the basics of informatics and its connection to radiation oncology, the book examines the process of healthcare delivery in radiation oncology, the challenges of managing images in radiotherapy, and the burgeoning field of radiogenomics. It then presents teaching, clinical trials, and research tools and describes open access clinical imaging archives in radiotherapy, techniques for maximizing information from multimodality imaging, and the roles of images in treatment planning. It also looks at how informatics can improve treatment planning, the safety and efficiency of delivery systems, image-guided patient positioning, and patient assessment. The book concludes with discussions on how outcomes modeling evaluates the effectiveness of treatments, how quality control informatics improves the reliability of processes, and how to perform quality assurance on the informatics tools. With contributions from a host of top international experts in radiation oncology, medical physics, and informatics, this book leads the way in moving the field forward. It encourages you to find new ways of applying informatics to radiation oncology and help your patients in their fight against cancer. "With the broad development and implementation of advanced technologies and systems, the book fills a gap in the knowledge domain of informatics in radiation oncology. The book provides a way to advance our field by deepening our knowledge of informatics and improving the efficiency of processes and effectiveness of our treatments. 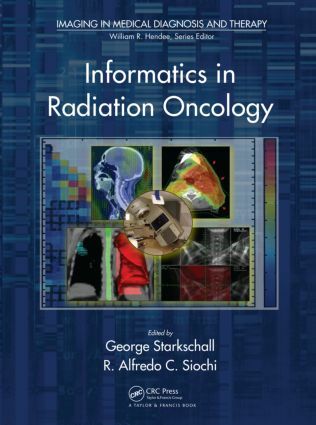 The book is comprehensive in scope with relevant discussions of informatics principles in radiation oncology that are not available in any other books." Radiogenomics: The Future of Personalized Radiation Therapy? George Starkschall, PhD, FACMP, FAAPM, is a professor in the Department of Radiation Physics and Graduate School of Biomedical Sciences at the University of Texas M.D. Anderson Cancer Center. Dr. Starkschall is a fellow of the American Association of Physicists in Medicine and the American College of Medical Physics and is the editor-in-chief of the Journal of Applied Clinical Medical Physics. He has been board certified in therapeutic radiological physics and radiation oncology physics. He earned a PhD in chemical physics from Harvard University. R. Alfredo Siochi, MS, PhD, MS, is an assistant professor in the Department of Radiation Oncology at the University of Iowa College of Medicine, where he also holds secondary appointments in the Department of Physics and Astronomy and the Department of Electrical and Computer Engineering. His research interests include model-based segmentation and 4D treatment planning, 4D cone beam reconstruction, and radiotherapy safety engineering and process improvement. Dr. Siochi earned a PhD in physics from the Virginia Polytechnic Institute and State University (Virginia Tech).